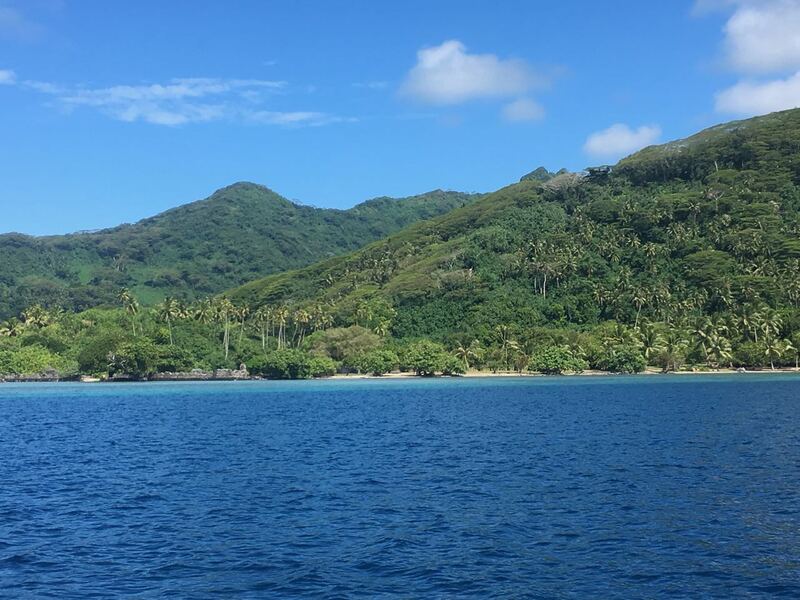 We departed Uturoa on Raiatea and explored a few lovely bay on our "home island". 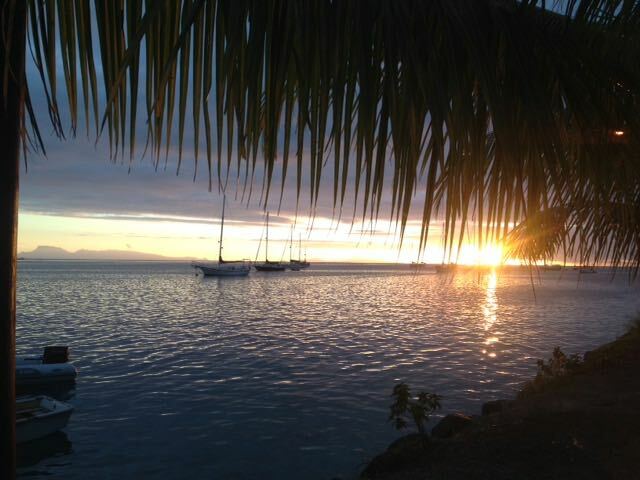 As we've mentioned, Uturoa is the second largest city in French Polynesia and the largest on Raiatea. We fought fuel problems from contaminated fuel in our two fuel tanks. 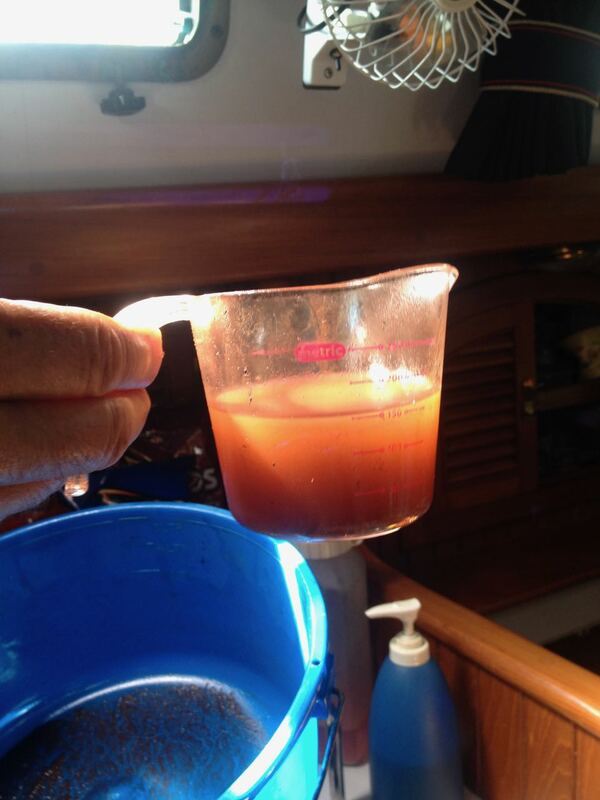 When water appears in the diesel fuel, bacteria can grow in the water and consume the diesel fuel. When they die, the little bacterial cadavers create a red contaminate that clogs filters and destroys injector jets. The process of draining the port fuel tank requires that I lie on the counter with my head in a cupboard and my right arm dangling in the tank. It's most unpleasant and I reel from the fumes. 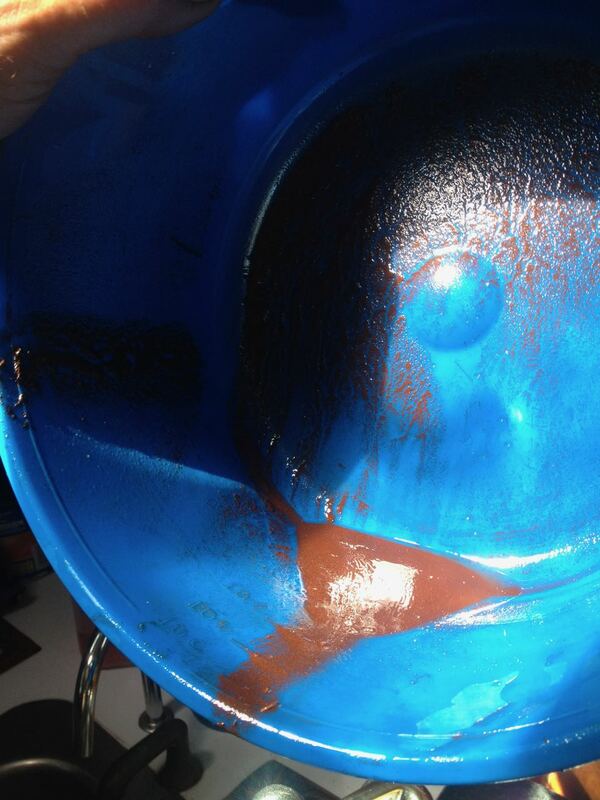 This is the fuel from the port tank that I recovered and discarded. Bacteria bodies: the classic red grit of billions of bacteria cadavers that ruin engines after they destroy filters. 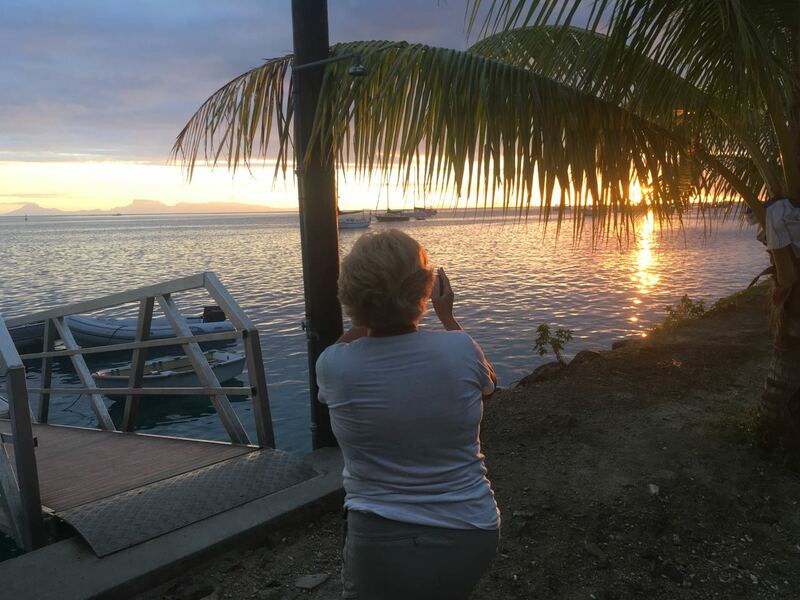 Each afternoon in Uturoa we walked a mile or so to the city marina from which we could get a decent Wifi signal. 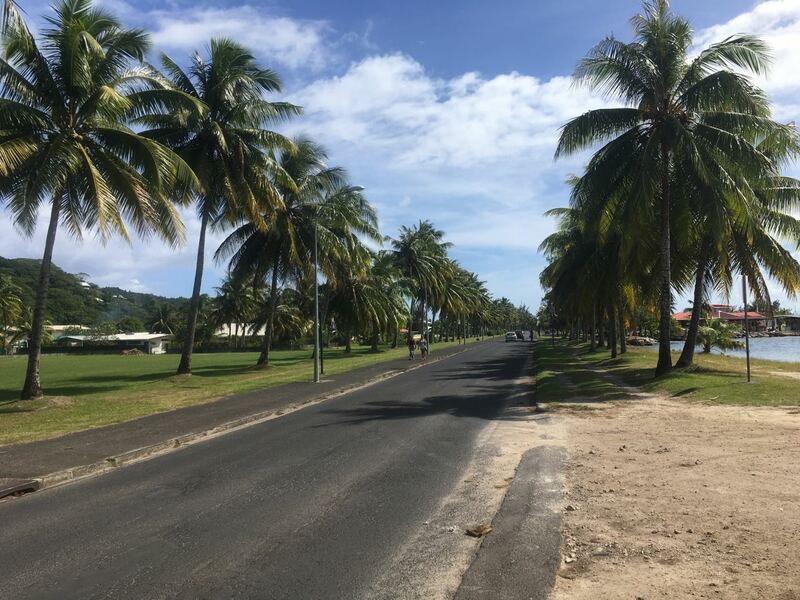 We walked along this lovely road next to the water. 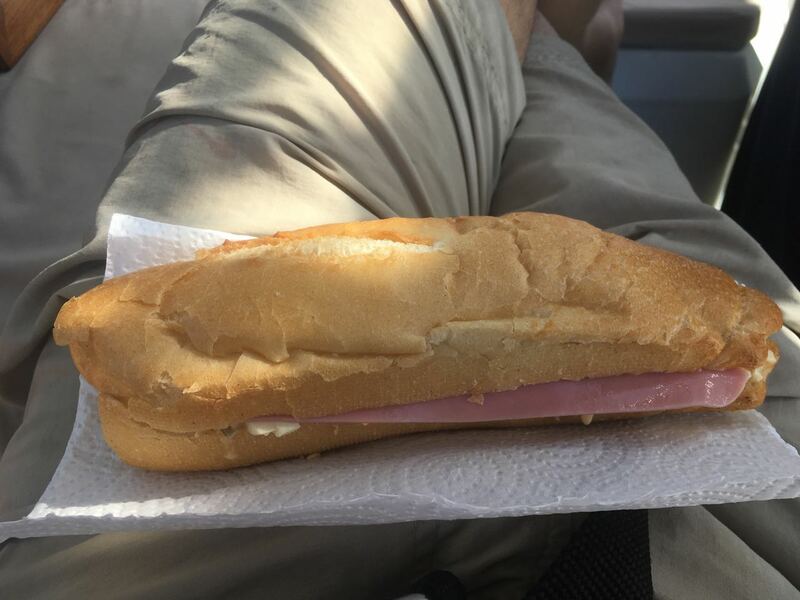 Conni recreated one of our favorite sandwiches by slicing a piece of baguette and adding homemade egg salad, ham, and cheese. Man, was it great! When those channel markers show danger, they aren't kidding! 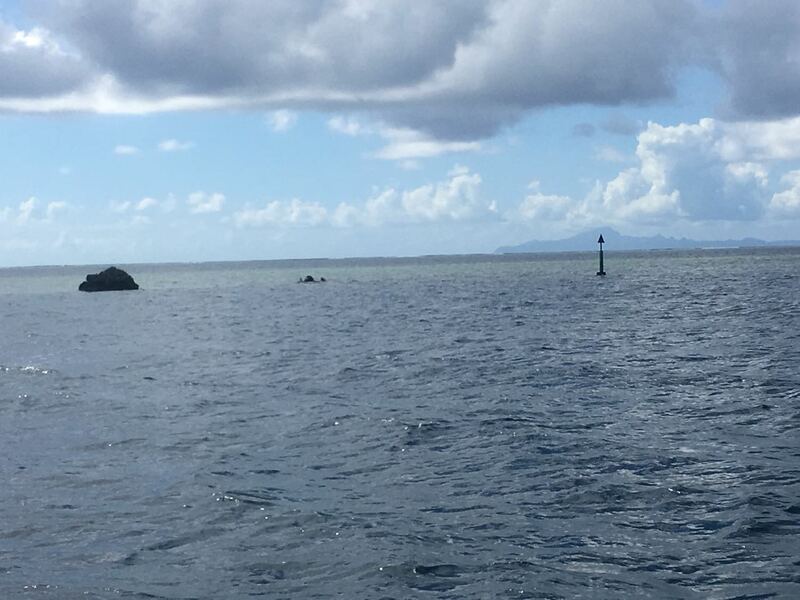 Yes, there are two rocks, but look at the shallows! Difficult to see, perhaps, but toward the left side of this photo is part of the stone marae for which Raiatea is known. It's part of Taputapuatoa, the sacred site of the Eastern Pacific. 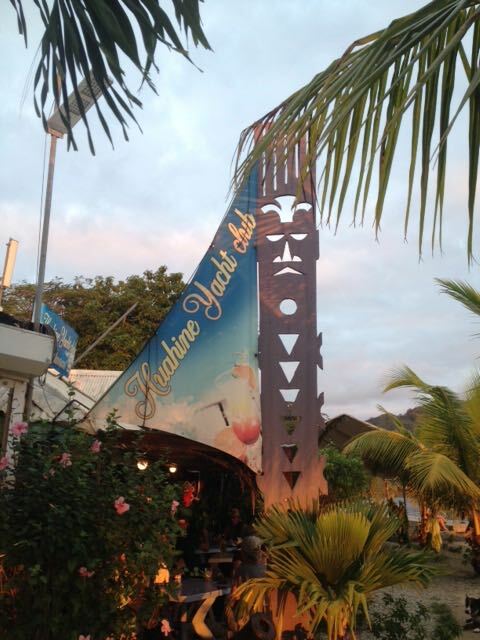 With a new sign, the Huahine Yacht Club moves in further uptown. This place knows what cruisers want: Wifi, good food, laundry service, and cold drinks. They've got it covered. 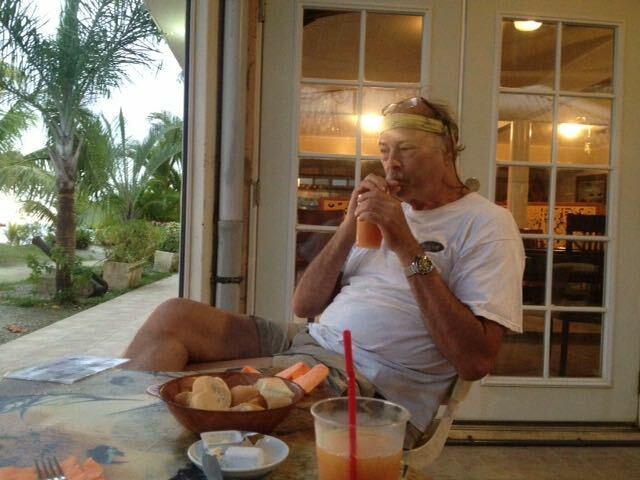 Suntanned Bill enjoys his Maitai. 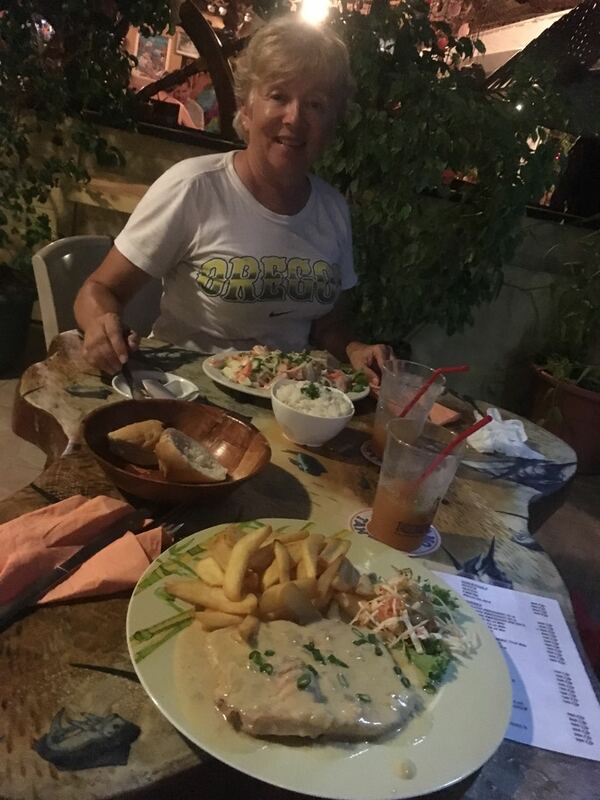 Our first night's dinner was poisson cru, the official dish of French Polynesia, and grilled marlin in vanilla sauce for me. 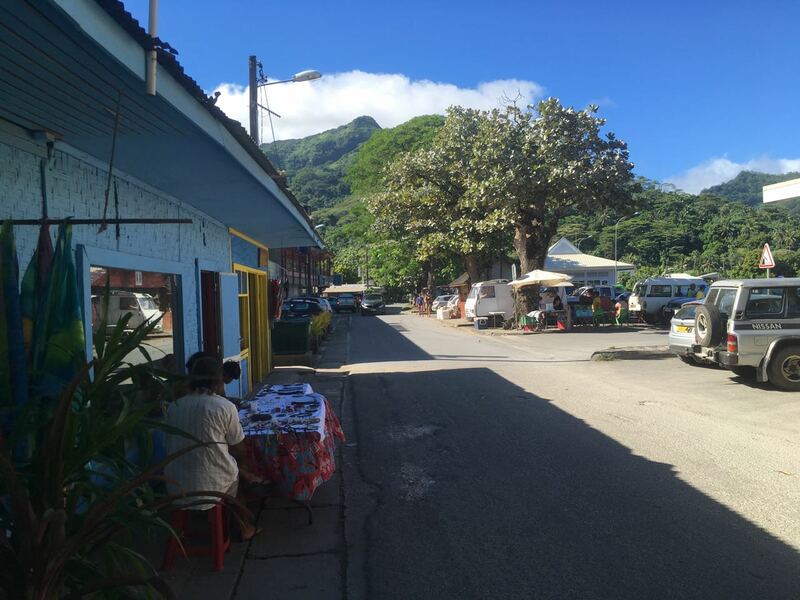 Fare in the morning sun with jewelry merchants keeping in the shade. 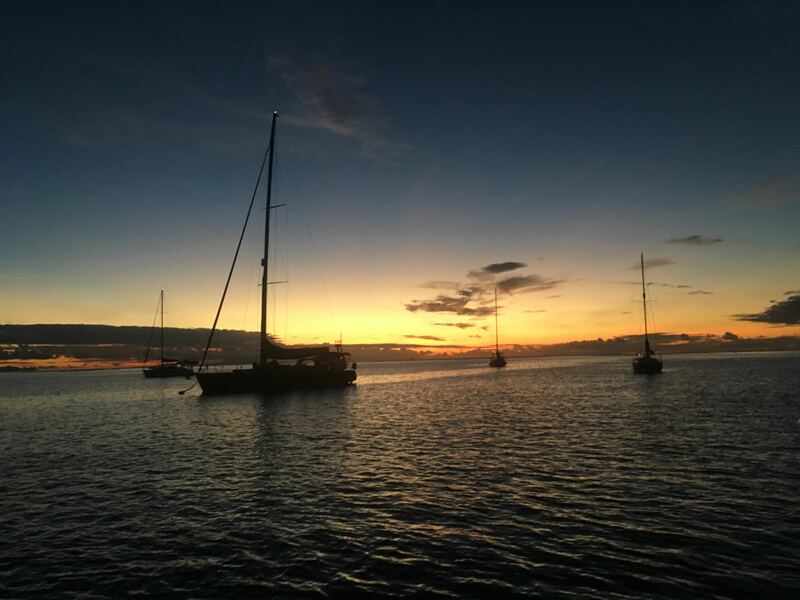 Fare sunset from the Huahine Yacht Club.